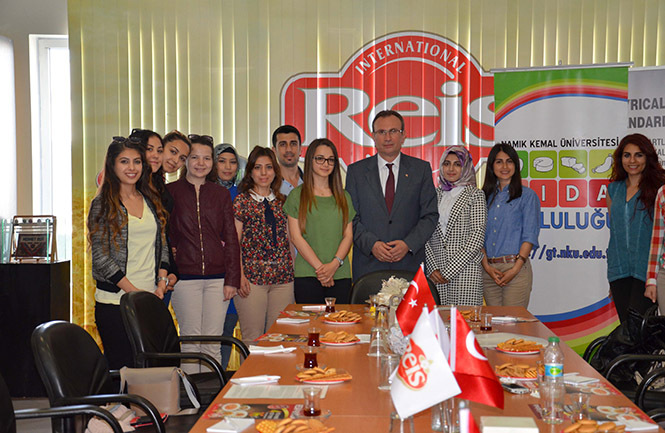 Namık Kemal University, Faculty of Agriculture Department of Food Engineering 4th grade students in Tekirdag joined the internship for a one whole day at Reis Gıda’s center in Esenyurt. In the internship program executed with the organization of the President of the Faculty of Agriculture Department of Food Engineering Prof. Dr. Mehmet Demirci, 15 students studying the last year of the food engineering met Reis Gıda Chariman of Board Mehmet Reis. In the program which lasted the whole day, the students of food engineering had a conversation with Mehmet Reis and gained information about Reis Gıda Factory. He raised awareness with his two projects against obesity called ‘’We are Done with Junk Food’’and ‘’Home Made Food, Account is Net’’. ‘’In the world, the the 33% of the global soil resources are unproductive. Human’s application on soil has also come to a critical level where the soil has decreased or consumed its basic functions of the soil. According to the statistics of United Nations (UN), it is estimated that the world population will exceed 9 billion. As a matter of fact, from one hand the world population increases, however from the other hand people living on the country sides continue to decrease. During the years of 2000s, 60% of the world population lived on the country side, while in 2050 it is estimated that this rate will decrease to 30%.Today,, 1 billion people are under the threat of starvation and unsufficient nutrition. The production of food problem will be discussed more in the future throughout the world. Also, over 1 billion people on planet are facing the diseases brought by obesity’’. Mehmet Reis, who has been saying that each country should have the food production in its own soils sufficient for its own internal consumption, also emphasized that no country should lay its back to another country thinking about importation for a subject vital as nutrition. Mehmet Reis, who remined that the family company Reis had its foundation in 1981, explained that the market has been trusting Reis since the day it went into action from his success story which started with a borrowed table and telephone. Reis Goda, which has been shaping the dru food sector for 34 years, is exporting to 4 continents and 20 countries says Mehmet Reis and added by saying that they export to America, Germany, Dubai, England, all over the world with the Reis branded rise and pulse products.